Engraving, Anonymous, 23.6 x 12.3 S (Paris). COLLECTION: Paris, Ba 12, p.13 (slightly stained at the upper right). The following bibliography would seem to refer to this print and/or the copy of it, Christ in a Niche III, E.158. Nagler, Monogrammisten, I, 1858, 869, no. 2021.11, as in the Delbecq Catalogue, III, no. 351, attributed to Boyvin. Destailleur, 1895, 277, under no. 1145, addition 2, as Boyvin, although this reference could be to Christ in a Niche I [E.156]. Emile Mâle, “Quelques imitations de la gravure italienne par les peintures français du XVIe siècle,” Mélanges offerts à M. Henry Lemonnier. 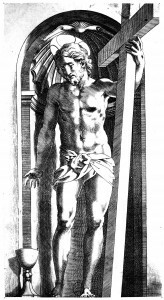 Archives de l’Art Français, nouvelle période, VII, 1913, 149-150, as after Rosso, as related to Michelangelo’s Minerva Christ, and as used as the model for a window in the choir of the church at Écouen, dated 1545. Zerner, in EdF, 1972, 247, under no. 279, and in Fontainebleau, 1973, II, 77, under no. 279, as after Rosso, seemingly by a French printmaker, and as inspired by Michelangelo’s Minerva Christ. Carroll, 1987, 352, 354, n. 1, under no. 111. 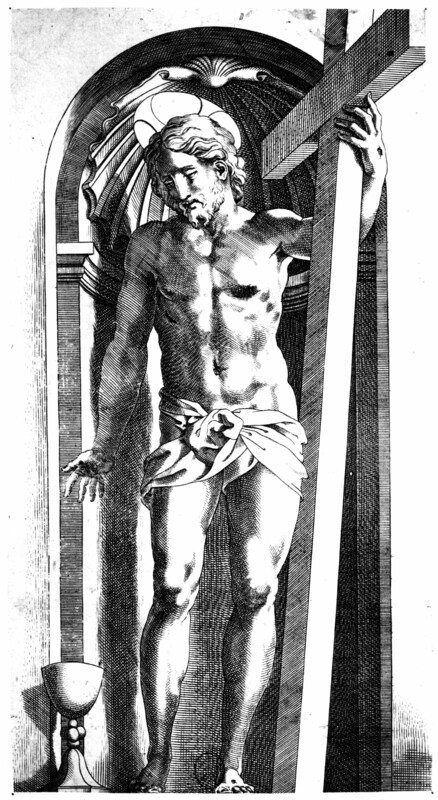 This print is a very accurate copy in reverse of Christ in a Niche I, but the contours of the figure in this copy tend to be slightly more undulating. COPY: For an anonymous copy in reverse, see Christ in a Niche III, E.158. 1 See also Leproux, 1988, 41.